Concluding the 2018 season at the gallery, Barbara Prey Projects is proud to announce Here and There, featuring recent travel paintings and local scenes from coastal Maine; August 15 - September 4. In constant dialogue with her surroundings, Barbara Prey never travels without her painting utensils; brushes, paint, sketchbook—always within reach. 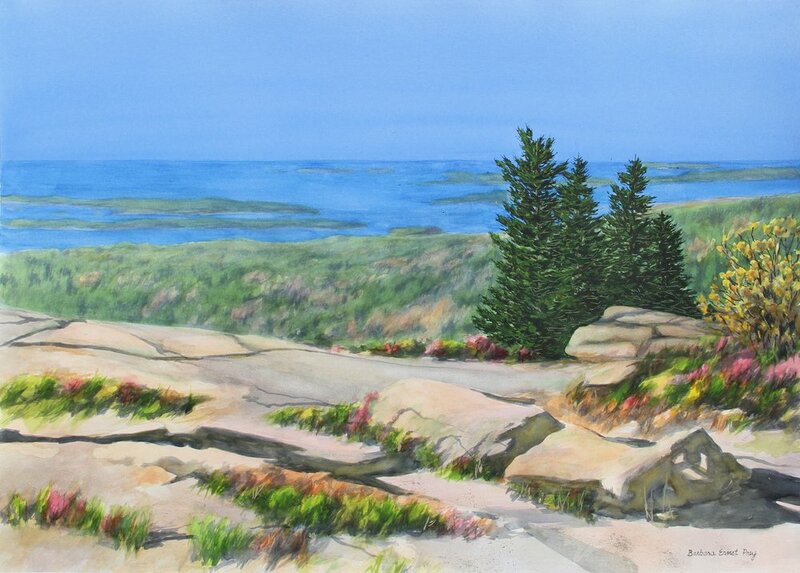 Here and There brings together memories and unique reflections from recent travels to Cuba and alpine regions in Europe to meet more familiar environs in her recent series of coastal Maine paintings. The world seen through the artist’s eyes, these works reveal Prey’s intense study and examination of her immediate surroundings. The travel paintings distinctively reflect on the artist as a world traveler; in her early formative years after graduation from Williams and Harvard, Prey received a Fulbright Scholarship and a grant from the Henry Luce Foundation, enabling her to travel, study, work and exhibit extensively in Europe and Asia—the sketch book always on hand. During her four years in Europe, the artist spent much time studying the lines of early Renaissance drawings, Gothic sculptures and architectural sketches. Absorbing her studies, Prey focused on drawing when she returned to the United States in the early 1980s where The New Yorker and other Magazines published her artwork for over 10 years. The artist's discoveries and memorable moments during her travels, the exposure to foreign cultures and new imagery are essential to her practice. Painting utensils as steady companions, Prey continues her journeys, always seeking out new sites to work “en plein air”. Past travels have taken the artist to Cuba, France, England, Scotland, Switzerland and Peru; "I’m always looking and distilling”, she states. Barbara Prey Projects is proud to announce Earth, Sea, Sky (South), featuring recent paintings of internationally celebrated artist Barbara Ernst Prey, July 15 - September 4. The title Earth, Sea, Sky (South) stands in reference to Prey's concurrent exhibition at the Wendell Gilley Museum (Barbara Ernst Prey: Earth, Sea, Sky July 1 to October 14, 2018) located north of Port Clyde on Mount Desert Island. This exhibition considers Prey's distinct perspective as a 21st century female artist, revising the male dominated art-historical watercolor tradition, as she explores the depth of the American landscape and American identity. Prey’s aesthetic vision is influenced by her scholarly background in art-history, memory and keen observation of her natural and man-made environs both intellectually and emotionally. The artist never shies away from challenging opportunities to open up new perspectives and push traditional boundaries. For her recent MASS MoCA commission, considered the largest watercolor in the world, Prey explored new ways to paint on a monumental scale. MASS MoCA just unveiled Building 6, a massive addition of 130,000 square feet of exhibition space, and to inaugurate the new wing, more than a dozen exhibitions by a powerful array of blue chip artists are on display, one of which is something of a meta-show. Barbara Ernst Prey‘s Building 6 Portrait: Interior consists of a singular work—a giant, framed, 8′ x 15′ watercolor painting depicting the pre-renovation version of the same space the piece is housed in. Her NASA commissions documenting space history changed Prey’s perspective, it required her to reflect on our place in the universe. New York based, Prey has maintained a studio on the coast of Maine for 40 years. The artist’s keen observation of “land, sea and sky” features works that mine a uniquely American tenor with a relationship between narrative and abstract, creating a tension that is both serene and unnerving. The often-seen empty stacked lobster traps or the crumbling façade set against an otherwise picturesque backdrop in Prey’s recent oil painting Weather Beaten serve as metaphors for the increasingly difficult lives of local fishermen. Acadia, 2018 depicts the stunning beauty of Mt. Desert Island, but in its vastness can be read as loneliness as well, while stressing the importance of nature in an age of fast-paced social media technology, and invites the viewer to pause and look - look at the rich colors, the layering of deep reds above the saturated blues and oranges, vividly reminding us of these spectacular color combinations from nature. Her dialogue with color drove Prey to develop groundbreaking, intricate layering techniques. Beginning with marks on paper, and then built up through her evocative use of color and dozens of thin washes, often incorporating parts of her surrounds - water, soil, crushed shells, paint chips from a former factory building add distinctive character to her work. The summer 2018 inaugural exhibition at Barbara Prey Projects will feature the artist's latest small-scale Maine oil paintings along with a new series of limited edition prints. Mostly known as a watercolorist, Prey has returned to oils, the medium in which she first began her instruction; the smaller size of the panels and the nature of the medium enable Prey to experiment with levels of freedom and informality not afforded by watercolor. The exhibition will expand her island series and—with a nod to Fairfield Porter—debut paintings of village scenes that reveal her continuous interest in architecture, thinking of her early illustrations for The New Yorker in the 1980s or most recently her 8 feet by 15 feet interior portrait for MASS MoCA. New print releases include Acadia (on view at the Wendell Gilley Museum, Southwest Harbor, June 30 through October 14, 2018) Gallantly Streaming (currently on exhibit at the U.S. Mission to the United Nations with prominent placement in the lobby) and Family Portrait (collection The Brooklyn Museum). The Massachusetts Museum of Contemporary Art (MASS MoCA) has commissioned Barbara Ernst Prey to paint a groundbreaking monumental watercolor for their new Building 6 that opened its doors to the public at the end of May 2017. Barbara Prey’s massive interior portrait of MASS MoCA’s 120,000 square foot Building 6 depicts part of the historic mill in its raw, un-renovated state, just prior to the beginning of the construction work. Measuring 8 feet tall by 15 feet wide, the painting is monumental by any standard, but for a watercolor on paper—perhaps the most unforgiving combination of any painterly media—the undertaking is truly breathtaking as it stretches the medium in new and exciting ways. The monumental scale of Prey’s project broke boundaries and opened up new ideas and concepts within the artist’s own practice; the project was a technical tour de force, requiring specially made papers, mounts, frames as well as an extra large studio space to paint. As an artist that works mainly on site, Prey spent countless hours in the space at MASS MoCA, looking, distilling and thinking about the architecture; as the concept developed, she started working on preliminary drawings during her visits. The studies began small and in pencil to accurately capture the architecture and overall composition; Prey then moved to color and larger formats, working out the light and the complex colors. The drawings displayed in this exhibition serve as references for the final painting and uniquely chronicle the development of Barbara Prey’s commission for MASS MoCA. Barbara Prey Projects is proud to announce Inflection Points, the most recent works of internationally celebrated artist Barbara Ernst Prey, July 15 - September 4. Taking the viewer from watercolors to oils, the White House to the Space Station, the architecture of Maine to the interior commission at MASS MoCA, this monumental and timely exhibit captures the Inflection Points of Barbara Ernst Prey’s place in American Art. This exhibit considers Prey's distinct perspective as a 21st century female artist, revising the male dominated art-historical watercolor tradition, as she explores the depth of the American landscape and American identity. Her work is part of a trajectory of American Art but built on abstract painting as well, with a conceptual underpinning of the composition and points of empathy around color, composition and subject. Her belief that color is the most powerful way to communicate drove Prey to develop groundbreaking, intricate layering techniques. Beginning with marks on paper, and then built up through her evocative use of color and dozens of thin washes, often incorporating parts of her surrounds- water, soil, crushed shells. The northeastern state has a long tradition in the history of American landscape painting, thinking of artists such as Hopper, Church, Homer, Wyeth—but few, if any, are women. And for Prey it is not only Maine’s history as a landscape subject that attracted generations of artists, there is a personal connection as she has family roots on the St. George Peninsula dating to the 1700s, when her mother’s ancestors lived in some of the same white houses that we now find in her paintings. 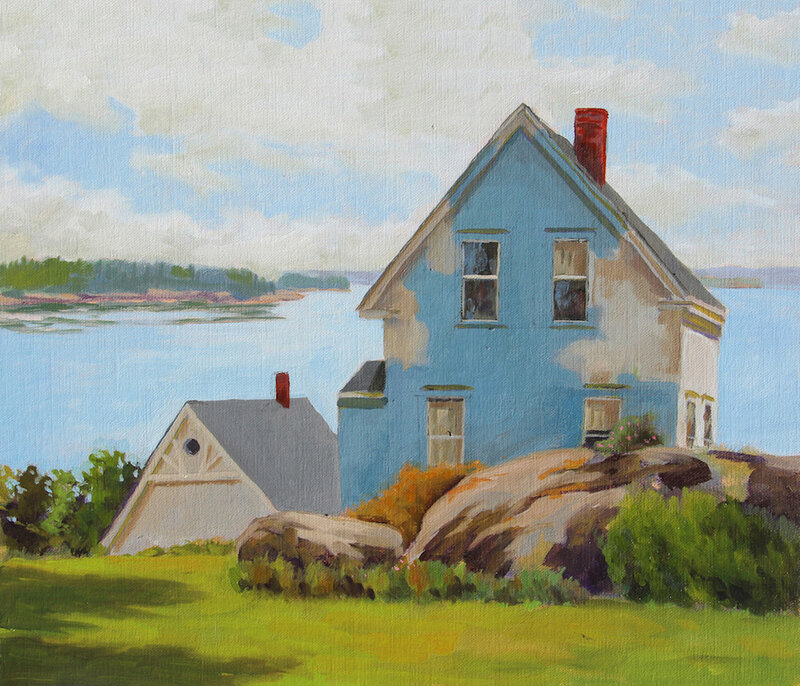 BARBARA PREY PROJECTS is pleased to open the season with “Barbara Ernst Prey: New Oils and Prints” featuring never before seen small-scale Maine oil paintings and a new series of limited edition prints by internationally acclaimed artist Barbara Ernst Prey. While Prey is mostly known as a watercolorist, the artist has recently returned to the medium in which she first began her instruction; the size of the panels and nature of the oil medium enabled Prey to experiment with levels of freedom and informality not afforded by watercolor. The exhibition will debut the paintings of nearby Seavy Island as well as new works from the artist’s Village Viewseries. New print releases include Gallantly Streaming (currently on exhibit at the U.S. Mission to the United Nations with prominent placement in the lobby) Family Portrait (collection The Brooklyn Museum), as well as two of her most sought after pieces Hydrangeas (Collection Bush Presidential Library) and The Collection will be on display in July. Prey is one of the key figures of 21st century painting. She was appointed by the President of the United States to the National Council on the Arts, the advisory board of the National Endowment for the Arts. Members are chosen for their established record of distinguished service and achievement in the arts. Previous members include noted artists Leonard Bernstein, John Steinbeck, and Helen Frankenthaler. Prey graduated from Williams College where she studied with Lane Faison as part of the Williams College Art Mafia and holds a master’s from Harvard University where she was able to continue her art history studies. She was awarded a Fulbright Scholarship and a Henry Luce Foundation grant that enabled her to travel, study and exhibit extensively in Europe and Asia. She is an art blogger for The Huffington Post, a frequent lecturer and an arts advocate as well as adjunct faculty at Williams College. Prey’s paintings are included in some of the most important public and private collections around the world including The White House (one of two living female artists), The National Endowment for the Arts, The Brooklyn Museum, The Smithsonian American Art Museum, the Kennedy Space Center, the Farnsworth Art Museum, Williams College Museum of Art, Hood Museum of Art Dartmouth College, The Taiwan Museum of Art, New York Historical Society, the Henry Luce Foundation and the Bush Presidential Library and Center. She is commissioned by NASA to document space history. Barbara Prey Projects is proud to announce In Search of America, the most recent works of internationally celebrated artist Barbara Ernst Prey, July 16-September 5. This monumental and timely exhibit explores memory, art history, and the influences of Color Field painters on the large-scale watercolors of Barbara Ernst Prey. In Search of America considers Prey's distinct perspective as a 21st century female artist, which is both essential to, and occasionally at odds with, her subjects as she explores the depth of the American landscape and American identity. Her belief that color is the most powerful way to communicate drove Prey to develop groundbreaking, intricate layering techniques. Beginning with marks on paper, and then built up through her evocative use of color and dozens of thin washes, often incorporating parts of her surrounds - water, soil, crushed shells - Prey's pieces defiantly search for America; asking questions of who am I and where are we going. While the work is predominantly American based in subject matter, the aura Prey produces thoughout her work can be appreciated on a global scale. The exhibit confirms Prey's place as one of the most significant American artists, furthering the genre of American driven landscapes. Prey was appointed by the President of the United States to the National Council on the Arts, the advisory board of the National Endowment for the Arts. Members are chosen for their established record of distinguished service and achievement in the arts. Previous members include noted artists Leonard Bernstein, John Steinbeck, Richard Diebenkorn and Isaac Stern. Her painting Lineleader, is currently on exhibit at the National Endowment for the Arts in the office of the Chairman. With work in the White House’s permanent collection, her appointment to the National Council on the Arts, as well as a long list of important private, public, national and international collections, her place as a significant American artist is secure. In Search of America features works that mine a uniquely American tenor in which color creates the relationship between narrative and abstract creating a tension that is both serene and unnerving. This is seen in her new landscape Marsh Grass, which cuts across the color wheel, layering rich developed blues directly above saturated yellows and oranges and pointing us back to these spectacular color combinations from nature. Prey’s technique is especially apparent in Meeting House in which each wash has subtly changed the nature of the piece until the depth and balance are achieved, making the painting as much a reflection of the space changing over time and the artist’s memory changing over time. Her brushwork and layering of color positively thrives within this piece and truly proves why the Heckscher Museum Director Michael Schantz said, “Barbara Ernst Prey [is] one of America’s most gifted watercolorists...Barbara’s flawless technique ranks her among the most important artists who ever painted in the medium.” In Search of America at Blue Water Fine Arts brings together some of Barbara’s most powerful works both conceptually and aesthetically. Her reflections on the contemporary American landscape will be recognized on the time line of art history. 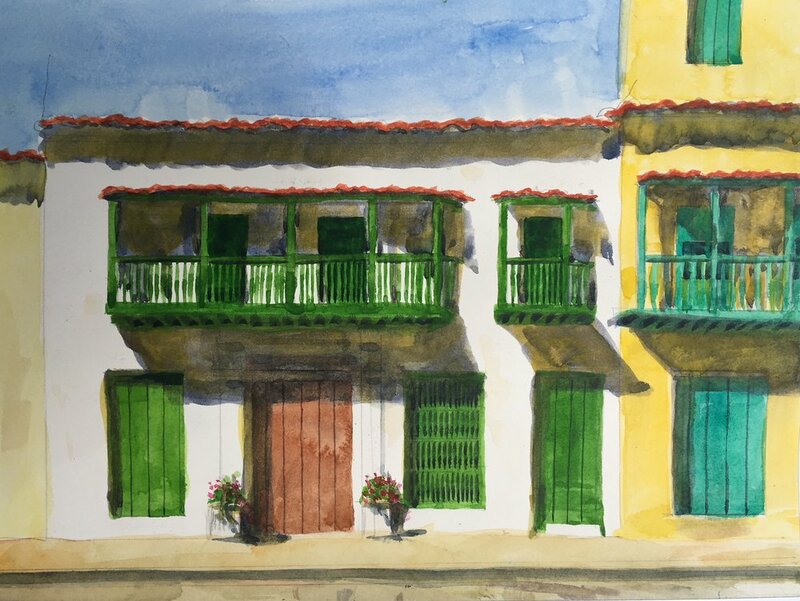 Barbara Prey Projects is pleased to announce ON SITE: BARBARA ERNST PREY’S TRAVELOGUES, a selection of never seen before travel paintings from Europe, Asia and South America. Barbara Ernst Prey is in constant dialogue with her surroundings, be it while exploring her immediate and familiar environs, while traveling the United States or the wide world. ON SITE brings together unique reflections and memories of the world seen through the artist’s eyes, works that reveal Prey’s intense study and examination of different cultural and art historical heritages. The travel paintings distinctively reflect on the artist as a world traveler; in her early formative years after graduation from Williams and Harvard, Prey received a Fulbright Scholarship and a grant from the Henry Luce Foundation, enabling her to travel, study, work and exhibit extensively in Europe and Asia—the sketch book always on hand. During her four years in Germany, the artist spent much time studying the lines of early Renaissance drawings, Gothic sculptures and architectural sketches. Absorbing her studies, Prey focused on drawing when she returned to the United States in the early 1980s where her illustration work got published in The New Yorker and other Magazines for over 10 years. The artist's discoveries and memorable moments during her travels, the exposure to foreign cultures and new imagery are essential to her practice. Painting utensils as steady companions, Prey continues her journeys, always seeking out new sites to work “en plein air”. Recent travels have taken her to France, Switzerland and Peru; the world comes together in ON SITE, where sceneries as diverse as a picturesque row of houses in a French village, snow covered Swiss mountains or colorful cityscapes of the Peruvian Andes join each other and beautifully prove artist-traveler Barbara Ernst Prey’s skilled eye: "I’m always looking and distilling”, she states. Barbara Prey Projects is pleased to open the season with “Barbara Ernst Prey: Prints and New Oils” featuring two distinct series; newly released limited edition prints and recent small-scale oil paintings. New print releases of Gallantly Streaming (currently on exhibit at the U.S. Mission to the United Nations with prominent placement in the lobby) and Parade Route (on view at the U.S. Embassy in Hong Kong) produced in collaboration with U.L.A.E., which produces prints of Robert Rauschenberg and Jasper Johns, are included in the exhibit as are prints of her iconic painting Patriot and her NASA commissioned work. A print of Family Portrait (collection The Brooklyn Museum), as well as two of her most sought after pieces Hydrangeas (Collection Bush Presidential Library) and The Collection will be on display in July. The Collection was selected by the U.S. State Department as the invitation image for every U.S. Ambassador and Embassy worldwide July 4th celebration. Also included in the exhibition is a selection of oil paintings featuring the recent “Village View” series as well as a group of small-scale plein air travel paintings. Those works mark a shift in Prey’s technique, and a return from works on paper into the oil paint medium. For the past four decades, Prey has been known for her incisive, saturated watercolors that operate as a record of the artist’s constant engagement with the multifaceted, ever-changing American landscape. In the past year, the artist has returned to the medium in which she first began her instruction, and created a new series of small-scale works on panel. The size of the panels and nature of the oil medium enabled Prey to experiment with levels of freedom and informality not afforded by watercolor. The “Village View” series is a synthesis of Prey’s dialogue with her surroundings in Port Clyde, Maine and her observations on the same location’s evolution over the course of 40 years. The exhibition presents a meditation on place. The creation of the “Village View” series presented Prey the opportunity to revisit the pathways, architectural structures, and vistas she had seen for decades and her family had known before her. The travel paintings distinctively reflect on the artist as a world traveler; in her early formative years, Prey travelled extensively on a grant from the Henry Luce Foundation—the sketch book always on hand. Barbara continues her journeys and has been working on a series of western/mountain paintings that will be exhibited in July; also on view will be recently finished Provence (France) paintings. Blue Water Fine Arts is proud to announce Re/Viewing the American Landscape, the most recent works of internationally celebrated artist Barbara Ernst Prey, July 20-August 31. This monumental exhibition explores the influences of memory, Color Field painters, and art history on the large-scale watercolor landscapes of Barbara Ernst Prey. Re/Viewing the American Landscape considers Prey’s distinct and evocative use of color as a 21st century female artist which is both essential to, and occasionally at odds with, her subjects as she explores the depth of the American landscape. Her belief that color is the most powerful way to communicate drove Prey to develop groundbreaking, intricate layering techniques, built up through dozens of thin washes on paper, often incorporating parts of her surrounds –water, soil, crushed shells - Prey’s pieces defiantly Re/View the American Landscape. While the work is predominantly American based in subject matter, the aura Prey produces throughout her work can be appreciated on a global scale. The exhibit proves Prey’s place as a significant American artist furthering the genre of American driven landscapes. Re/Viewing the American Landscape features works that explore natural instances in which color creates a jarring balance. This is seen in her new piece Quadricentennial Nocturne, which cuts across the color wheel, layering rich developed blues directly above saturated yellows and oranges and pointing us back to these spectacular color combinations from nature. Prey’s technique is especially apparent in Fibonacci’s Workshop in which each wash has subtly changed the nature of the piece until the depth and balance are achieved, making the painting as much a reflection of the space changing over time and the artist’s memory changing over time. Her brushwork and layering of color positively thrives within this piece and truly proves why the Heckscher Museum Director Michael Schantz said, “Barbara Ernst Prey [is] one of America’s most gifted watercolorists…Barbara’s flawless technique ranks her among the most important artists who ever painted in the medium.” Re/Viewing the American Landscape at Blue Water Fine Arts brings together some of Barbara’s most powerful works both conceptually and aesthetically. Her reflections on the contemporary American landscape will be recognized on the time line of art history. Blue Water Fine Arts celebrates its 15th Year with Barbara Ernst Prey: Prints and Drawings featuring a series of twenty newly released prints from July 1 to July 20. New print releases of God and Country (exhibited at the U.S. Embassy Residence in Paris and part of Prey’s 9/11 series) and Parade Route (currently on view at the U.S. Embassy in Hong Kong) produced in collaboration with U.L.A.E., which produces prints of Robert Rauschenberg and Jasper Johns, are included in the exhibit as are prints of her iconic painting Patriot and her NASA commissioned work. Prey’s paintings are in some of the most important collections worldwide including The White House, The Brooklyn Museum, the Smithsonian American Art Museum, Kennedy Space Center and Tom Hanks. She was commissioned by the President of the United States to paint the official White House Holiday Card and by NASA to document space history. A print of Family Portrait (collection The Brooklyn Museum), as well as two of her most sought after pieces Hydrangeas (Collection Bush Presidential Library) and The Collection will be on display in July. The Collection was selected by the U.S. State Department as the invitation image for every U.S. Ambassador and Embassy worldwide July 4th celebration. Also included in the exhibit is a selection of small originals offering a preview of her upcoming annual exhibit, showcasing her virtuosic technique, authentic vision and distinctly American style. As Barbara continues her course of creating visually distinct and compelling work, for which she has garnered international recognition, this exhibit explores and highlights a new aspect of her practice rarely seen in her previous exhibitions-her drawings and travel drawings. These works distinctively reflect on Barbara’s early years as a painter as she traveled to Tainan, Taiwan on a grant from The Henry Luce Foundation and her early career as an illustrator for various publications such as The New Yorker, Gourmet and The New York Times. The Prints and Drawing Show illuminates the importance of Prey’s progression as an artist and allows the viewer insight into Prey’s current practice. This is truly a great opportunity to have access to a diverse range of Barbara’s original fine art prints. American Contemporary is Barbara Preys most recent body of spiritually driven landscapes. Her work encompasses the traditional in a contemporary light. In this exhibit she explores the depth of the American landscape and her own personal relationship with nature, and illuminates these concepts by using her euphoric color palette and impeccable painting techniques. Her paintings challenge the viewer to step back and take into consideration their own identity, as well as their personal connection to their surroundings. While the work is predominantly American based in subject matter, the aura Prey produces throughout her work can be appreciated on a global scale. The exhibition proves Preys place as a significant American artist furthering the genre of American driven landscapes.